Handcrafted in the USA - Unique, fun and functional bath soaps, bubble bath and accessories. Seasonal & Everyday Bath Creations. Creators of the ORIGINAL My Pet Fish® Soap in a Bag! Geek & Museum soaps including our It's Elementary® Periodic Table of Element Soaps. Custom orders welcome. 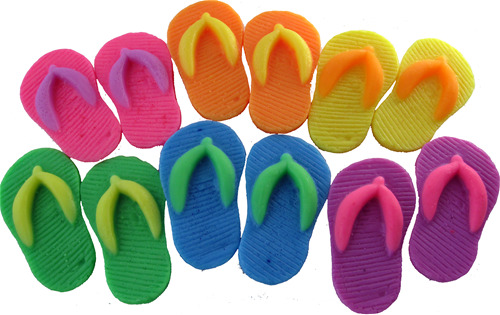 Remember the days when you were young and you went to the carnival? Everyone always won a little goldfish and took them home in a bag of water. Well here is our rendition of this magical childhood memory. 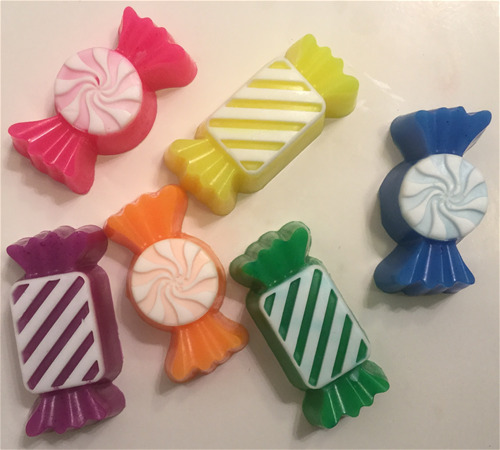 Each Soap is a generous 5 ounces of crystal clear unscented hypoallergenic glycerin soap with a small plastic fish embedded into it so children get a prize for getting clean! Just peel off the bag and soap as usual. When your soap is all gone, you have a fish to swim with! 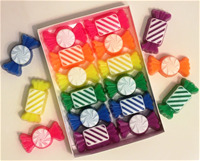 Our adorable Sweet Shop Soaps are a gift box of 12 vibrantly colored and scrumptiously scented handcrafted candy shape soaps. Each soap is personal or guest sized and measures 2 3/4in wide x 1 1/2in long x 1in deep. Perfect gift for Mothers Day, Birthdays, Graduation or just because! Soaps are individually handcrafted and are shrink wrapped to lock in their fragrance and keep out moisture then packaged in a white box with clear cover. Handcrafted of all natural glycerine soap, Hypoallergenic and Certified Cruelty Free! Conforms to vegan standards - NOT tested on Animals!